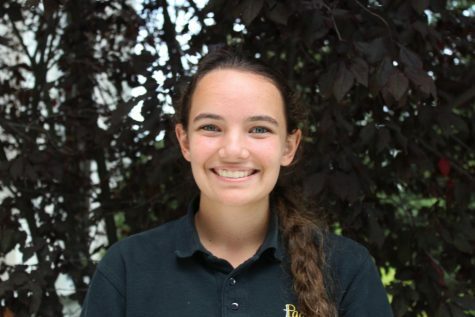 Maddy is a sophomore at Padua Academy. She was born on September 30, 2002. For middle school, she went to Immaculate Conception School in Elkton, Maryland. She currently lives in Newark, Delaware. Maddy chose Padua because of a close friend. They had always promised each other they would both go to Padua for high school, and both of them fulfilled the promise. In school, her favorite subject is Italian. She also plays on the field hockey team. Maddy has a 12-year-old sister, Mackenzie. She also has a dog named Finnick whose name comes from one of her favorite movies: The Hunger Games Catching Fire. Her family is a member of the Vacation Club at Disney World. This past July, they went on vacation there and are planning to go back soon. Maddy is afraid of snakes, but does like Beluga whales. Maddy isn’t sure about what college she likes or what career she wants right now, but is thinking about working as a detective.